But many still get confused as to how to keep ERC20 tokens safe and secure. Well, the answer is you should keep them in self-hosted wallets such as Ledger Nano S. But using Ledger Nano S directly for ERC20 tokens is not possible. And that’s why it is a bit tricky too. To manage ERC20 tokens on Ledger Nano S you need to use a third party wallet interface i.e. MyEtherWallet (aka MEW). Don’t panic. 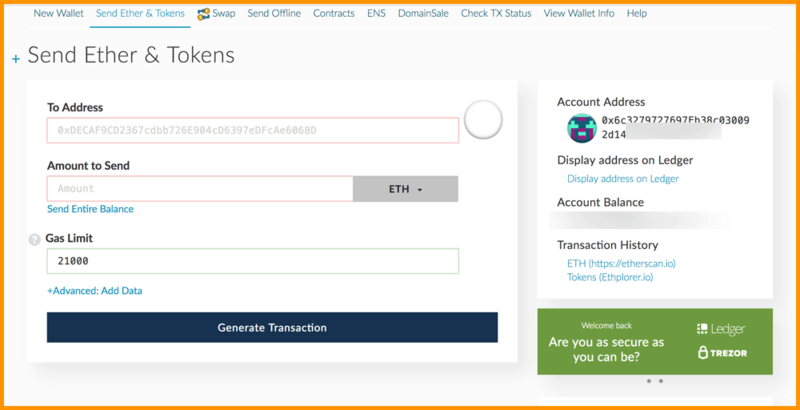 We will make this tricky process simple and help you understand how to send ERC20 tokens from a Ledger Nano S.
Note: I am assuming that you have your ERC20 tokens stored on a Ledger Nano S for this tutorial. Step #1. 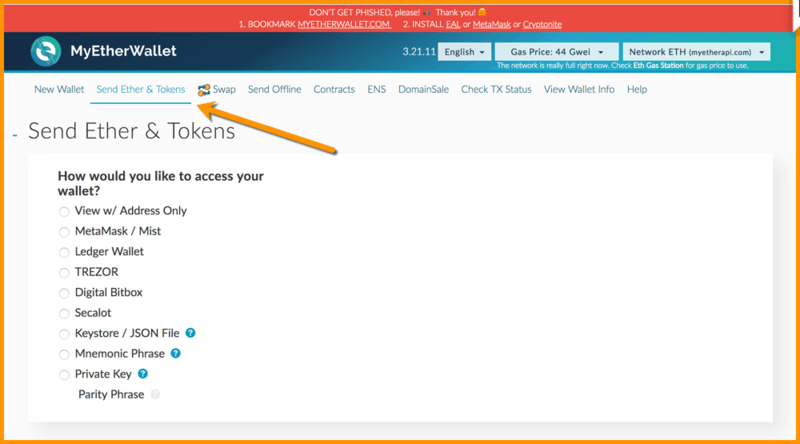 Go to www.myetherwallet.com and click on ‘Send Ether & Tokens’ as shown in the image below. Step #3. Now connect your Ledger Nano S device to your system and put your PIN number to activate it. Then go to your Ledger Wallet Ethereum app in the Ledger Nano S and open it. Step #4. Once you have opened the Ethereum app in your Ledger Nano S device, make sure your browser support is enabled. If not, go to Settings -> Browser Support, and set it to “Yes”. Step #5. After making sure of it, keep the Ethereum app open in your Ledger Nano S device and click on ‘Connect to Ledger Wallet’ option as shown in Step #2. Step #6. After clicking ‘Connect to Ledger Wallet’ option you will see a screen where you need to click on ‘Unlock your wallet’ option at the bottom right as shown in the below image. 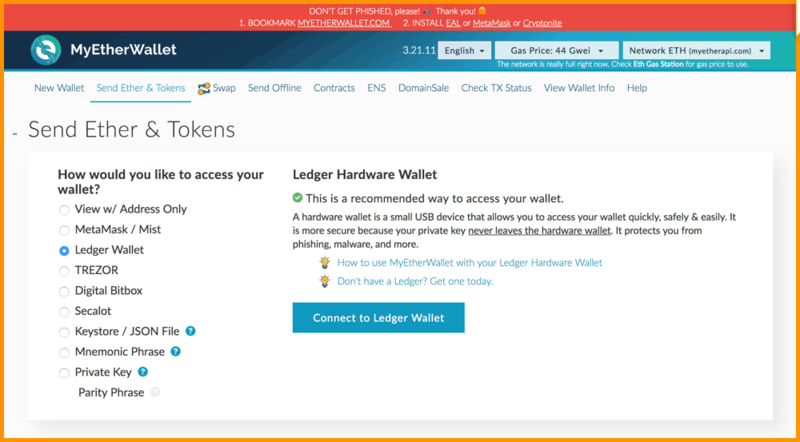 Remember, this wallet is the Ledger wallet that you are accessing via MyEtherWallet. Step #8. 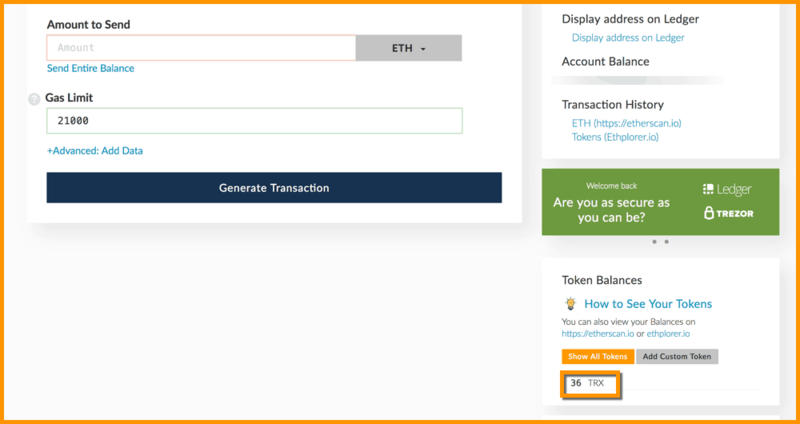 Now the main difference starts as transferring ETH is simple and straightforward but for accessing tokens you need explore the token balances. Step #9. On the same screen, as shown in step #7, you will see the ‘Token Balances’ section. 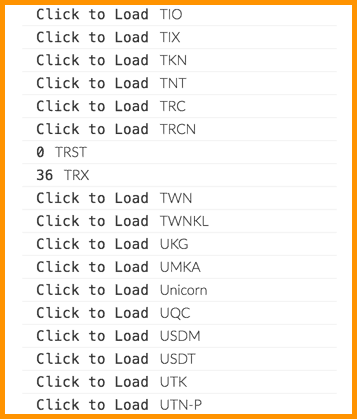 Under this, click on ‘Show All Tokens’ and search for your token which you want to transfer out of the Ledger Nano S.
From this list, click on ‘Click to load’ in front of your token. In this example, I had TRX balance so I clicked on ‘Click to load’ in front of it. Remember, you should have positive balance tor transfer ERC20. 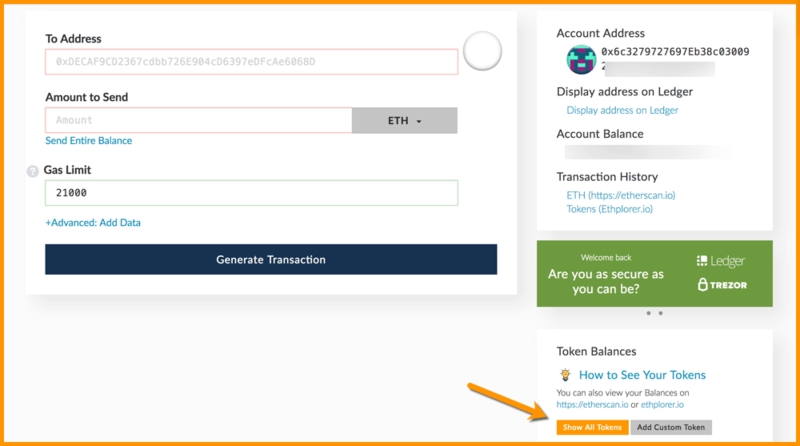 Also, just in case if you are not able to find your ERC20 token, you might need to perform a couple of steps to add a custom ERC20 in MyEtherWallet. 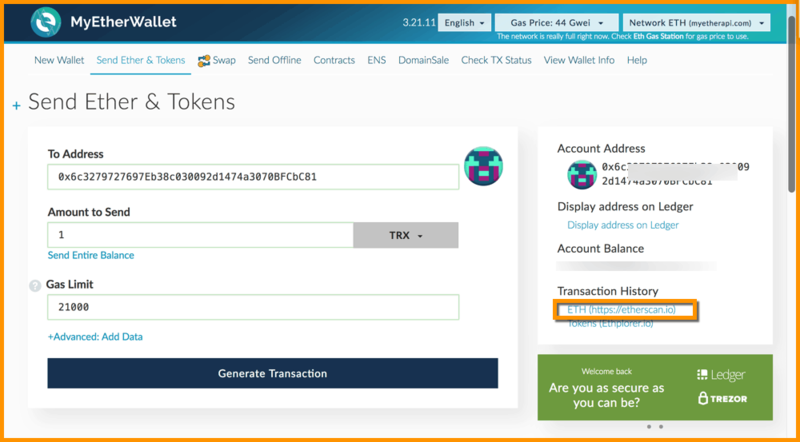 Here is the step-by-step guide for doing the same: The Step-By-Step Guide To Adding A Custom Token In MyEtherWallet [MEW]. Step #12. 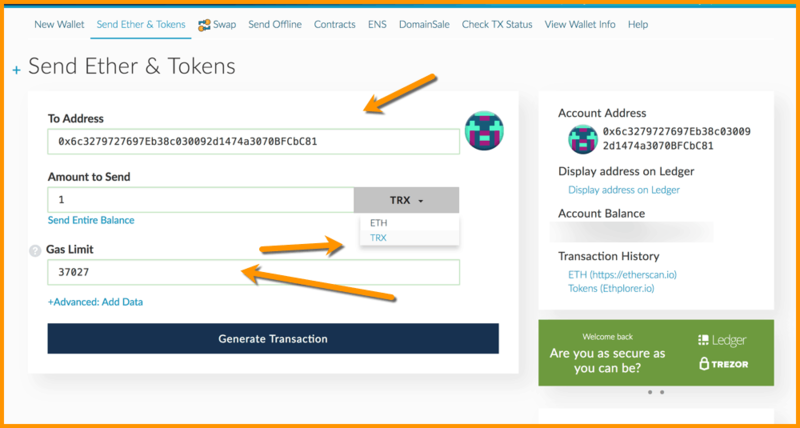 To transfer the TRX ERC20 token from Ledger Nano S, select the options as shown below and put the correct recipient address in the ‘To Address’ field. Note: when you enter the ‘Amount to Send’ the ‘Gas Limit’ field will be auto-populated, so don’t change that. Also, make sure that you have some Ether on this address on which you have your ERC20 to be used as ‘Gas’ otherwise your transaction will not be completed. Step # 14. 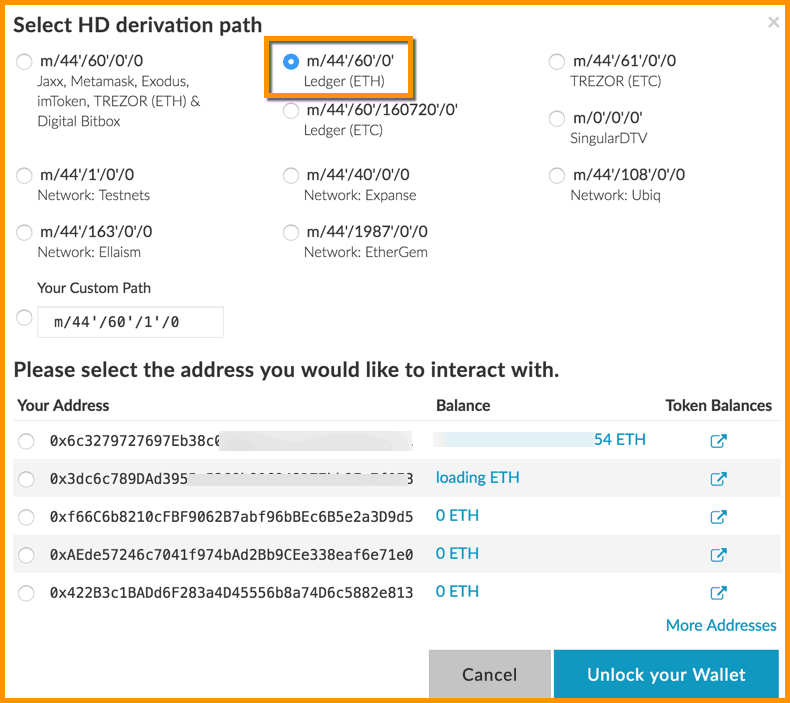 Confirm your transaction on Ledger Nano S device interface. 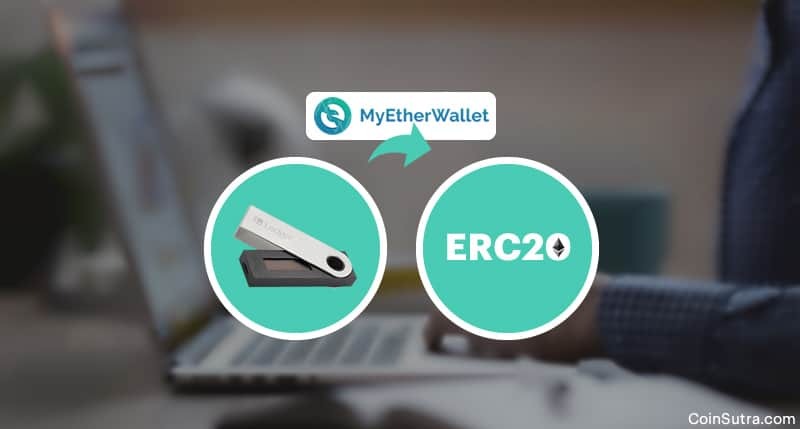 So that covers all you need to know and understand to transfer ERC20 tokens from Ledger Nano S using MEW. In the next article, we will talk about how to transfer ERC20 tokens to Ledger Nano S and that will sum up Ledger’s use for managing ERC20 tokens. If you have any questions regarding the same, feel free to ask in the comment section below! Also, don’t forget to share the post. Confused About Which Multi-Cryptocurrency Wallet To Pick?